One night a week I like to treat my skin with masks, serums and various products varying depending on what I feel my skin needs. 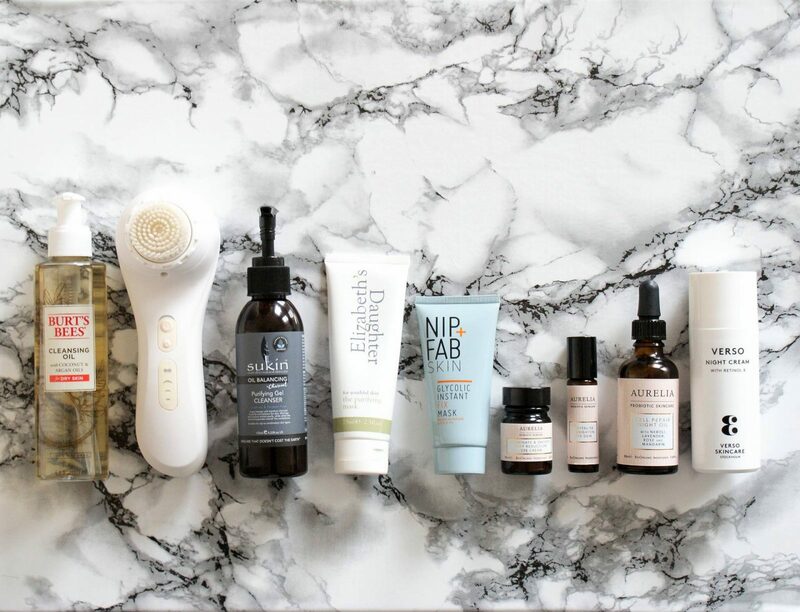 Whether it’s extra hydration, calming, oil balancing, exfoliation, pay attention to your skin and determine what it needs. Don’t forget our skin isn’t one ‘type’ all over our face so it’s not necessarily a one product fits all situation, you can target specific areas by face-mapping and determining what area needs what treatment. Your t-zone may be oily and need a purifying treatment, at the same time you can use a hydrating mask in any dry areas areas. First I cleansed with @burtsbeeseu Cleansing Oil with Coconut & Argan Oils. 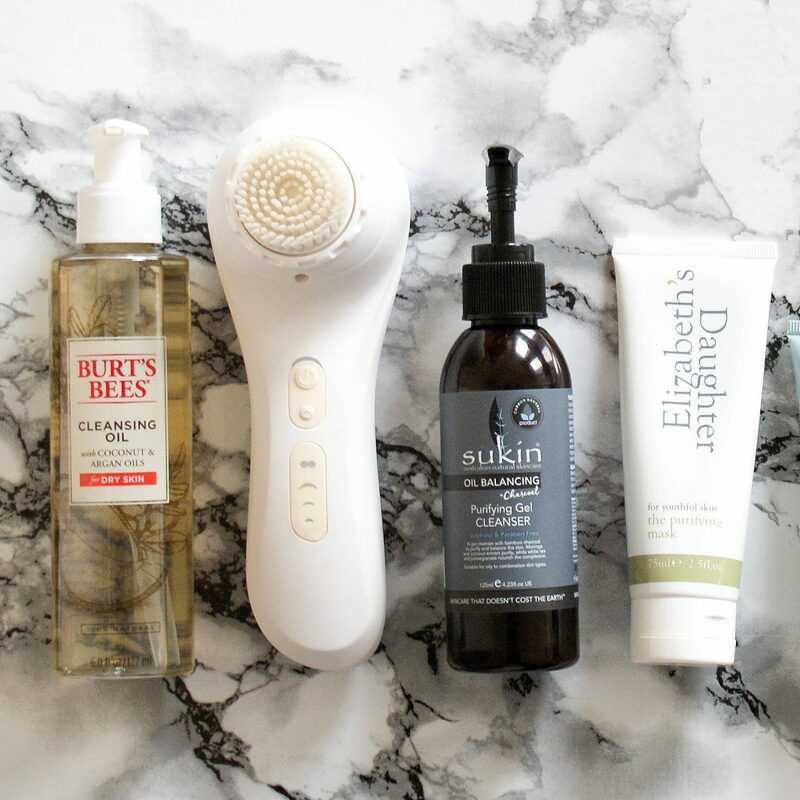 I love oil cleansers as they help to balance out the production of oil in my skin, I particularly love this NEW Burt’s Bees one. There is no residue left on my skin after using, it’s non-comedogenic (doesn’t block your pores! ), smells gorgeous and has no nasties such as parabens/phthalates/petrolatum/SLS and no animal testing. The second cleanse is with Magnitone & Sukin Skincare. The Magnitone uses a combination of sonic oscillations + pulsed vibrations to deep-cleanse, massage and tone your skin at the same time, just like a mini workout for your face. It effectively ‘wobbles’ the dirt out of the bottom of your pores, making sure you are cleansing the depths of your skin and allowing your evening skincare to be able to penetrate the skin properly and do its work. Sukin’s oil balancing gel based cleanser works well with the Magnitone, it has no harsh ingredients such as Sodium Lauryl/Laureth Sulphate that can dry your skin out, and is cruelty & paraben free. Enriched with bamboo charcoal to purify and balance the complexion which is perfect for my oily skin. The first of two masks to draw out impurities around my t-zone is the Elizabeth’s Daughter Purifying Mask. The Purifying Mask. A deep cleansing mask to help purify skin with Omegas 3, 6 and 9 which help support tissue regeneration, condition the skin and are particularly effective on skin which is inflamed. Amazonian White Clay is very rich in mineral salts helping to eliminate toxins; plant extracts with sebum regulating properties to help rebalance skin. Apply to clean, dry skin and leave for approximately 3 minutes before removing with a warm, damp muslin cloth. The second mask by Nip+Fab is to refine pores, fine lines and smooth skin, see my review on this mask here. The Gycolic Acid in the mask acts as a liquid exfoliator removing all the dead skin cells, leaving you with smooth and radiant skin.Apply a thin layer to skin and leave for 1o minutes. I create an eye treatment by using both products in the Aurelia Skincare Eye Duo, which can normally be used one for day and one for night. First apply the serum – a refreshing wrinkle reduction dew for tired eyes. The cooling rollerball application provides a gentle lymphatic massage ensuring the blend of actives and absorb to brighten and firm the delicate eye area. High levels of their signature probiotic, peptide and repair technologies will help to reduce inflammation and dark circles. The unique eye complex has been scientifically proven to result in an age correction improvement of 5 years in just 28 days of daily use. After allowing the serum to penetrate the skin, apply the eye cream, an indulgence for the eye area. This light cream is packed with supercharged levels of Aurelia Skincare’s probiotic and repair technologies. It seriously works to reduce inflammation, fine lines, wrinkles, puffiness and dark circles. All Aurelia products adhere to a VERY strict free from & ethics policy. No Nasties, Cruelty Free, Ethically Sourced. 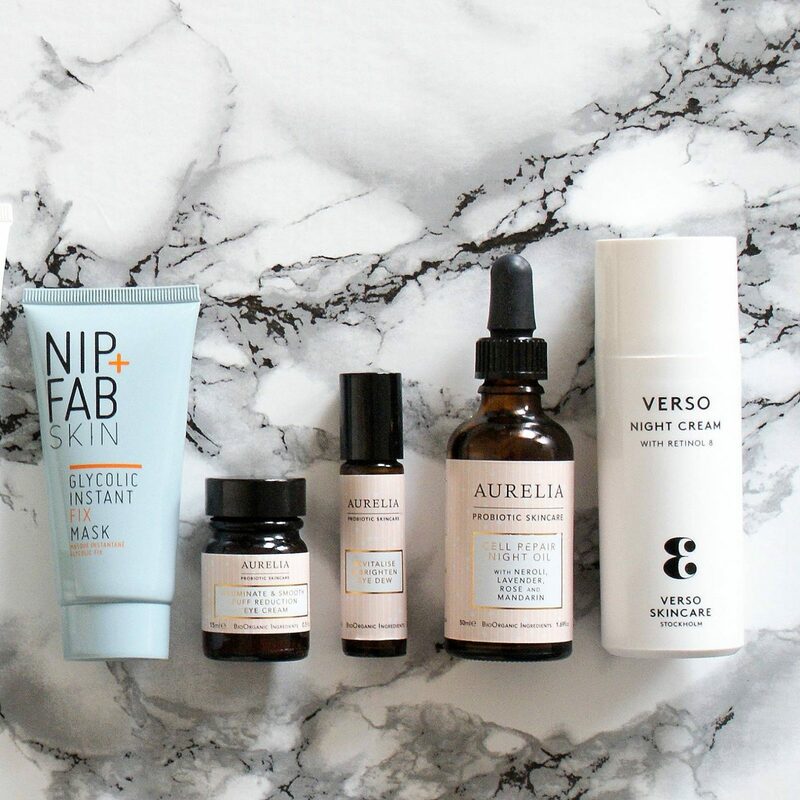 I apply Aurelia Skincare Cell Repair Night Oil facial oil after my masks for some deep hydration, this exquisite oil instantly absorbs to work on all fronts. Providing abundant essential fatty acids, it helps to restructure and regenerate the epidermis, firms and tones, delivers precious Omega 3, 6 & 9 and antioxidants to fight free radicals and reduce oxidative stress. With a stunning, natural fragrance of a floral blend of Neroli, Lavender, Rose and Mandarin, this addictive Cell Repair Night Oil works to hydrate and soothe dull and dehydrated skin promoting a luminous, dewy and radiant glow whilst helping to prevent skin ageing. I love breathing this in deeply with my hands cupped over my nose to inhale the benefits of these beautiful oils. My final product is Verso Skincare Night Cream. A Calming and repairing night cream with Retinol 8 (a stabilized Vitamin A complex which is eight times more effective than standard Retinol). This nourishing cream has a calming and repairing effect on the skin and smells delicious. It helps to increase the skin’s own production of collagen, reversing the signs of aging. Anti-oxidants from oats help protect your skin from future damage. I notice my skin much plumper in the morning after using this! Then it is time to make a cup of Pukka Herb’s Night Time Tea and relax and let your skin soak up all this goodness!